To anyone who has been in this hobby for a while, this is the Monogram molding of the B-25J Mitchell. This kit has been done in three versions. One is the gun nose B-25J, one is the cannon armed B-25H, and this is the glass nosed B-25J. Sorry for no sprue shots, but there is simply too much plastic to properly lay things out. Let me preface any description by telling you that it is raised panel line technology that was typical of the 70s when this kit was released. I can also report that despite the age of the molds and the number of times this kit has been pressed, the parts are remarkably flash free without any obvious sink areas, even opposite the alignment pins on the fuselage halves. The detail on the inside of the fuselage halves is exceptionally nice. 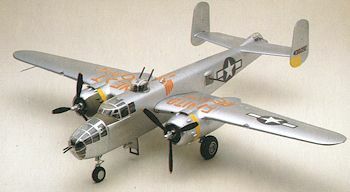 We have all come to expect this from these older Monogram bomber kits and it is a shame that much of that will disappear when the fuselage halves are closed. The cockpit is very nicely appointed with a pair of seats with belt detail molded in place, an instrument panel with console and the control wheels. Again, a lot of detail, most of which will not be seen. The kit comes with a full bomb bay, the fore and aft walls of which contain wing spars. There are racks for a full bomb load and the bomb bay doors can be posed open. Other things that can be done open are the front and rear boarding hatches. In fact, you'll need to have the rear hatch down so it, along with a small wooden step, can be used to hold the kit off its tail. For those wanting to not use this method, Terry Dean makes lead nose weights specifically for this kit that are form fitted for the sides of the nose gear well. Engines are s simple forward face that fit into one-piece cowlings. You will have to attach a small exhaust stack or two to the cowlings, but not a difficult task. The kit comes with all the guns you need including a tail gun, a rotatable upper gun turret, side guns and nose guns. There are also forward gun blisters that you can install depending on which version you are doing. 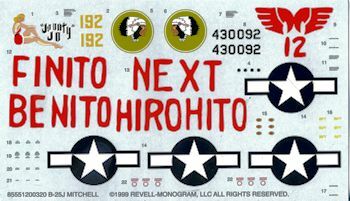 The box art aircraft is strafer and so there is a separate sprue of clear bits just for the nose with the four extra gun holes drilled into it. Clear bits are well done with prominent frame lines to aid in masking. Landing gear are well done and where required (as in the nose gear) there is nice wheel well detail. The instruction sheet is well drawn with parts identified as well as color information supplied. There are markings for two planes. One is the box art plane from the 398th Bomb Squadron in New Guinea during mid 1945. This one is olive drab over neutral grey. The other is an unpainted plane from the 12th Air Force on Corsica during 1944 with a rather large slogan on the upper wing and yellow trim. 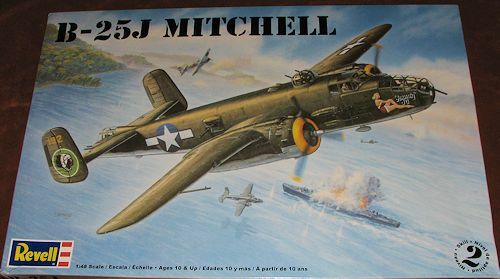 There are few 1/48 WWII modelers who have not built one of Monogram's nice B-25J kits. I did the gun nose version many years back and picked this one up as I'd like to do the 'glass nose' version to add to the collection. While the price had climbed over the years, it is still nicely molded and a good value for your hobby dollars. As a note, R-M did not cave into Boeing's leeches on this one as it is not licensed, another good reason to pick it up.